As an added bonus, and because the muppet bloggers at Two-Headed Chemical Mayhem have been quiet lately, the mystery flask comes with CORK RING! Yeah, I'd do this tonight, but I definitely left the reference in the lab. Oops! Ooooo...Pretty!!! I like the purple. I've seen stuff like this before, but I'm not sure what this is. The white crystals look similar to something growing on a bottle of triethylamine in my stockroom. I know what is growing on my bottle of TEA, I just don't know where the H+ is coming from. White stuff = oxidized (excess) aldehyde starting material? Some product of an uncontrollable chlorination reaction with POCl3 and catalytic N,N-dimethylaniline. paul- question: most of the phthalocyanines i've worked with were green, but they had bulky groups on them to reduce aggregation. is regular phthalocyanine purple? It's really more reddish-violet than purple, if that helps...also, no aldehyde in or out. No chlorine, either. And it's not a porphyrin or phthalocyanine...keep guessing! I've seen sugar crystallize out of strawberry jam before, but not into needles like that! AHA! Molten solvent! Getting closer! I've managed to distill imidazole at about 190 deg C under vacuum though. It was strange. I'm pretty sure the white stuff is the imidazole. 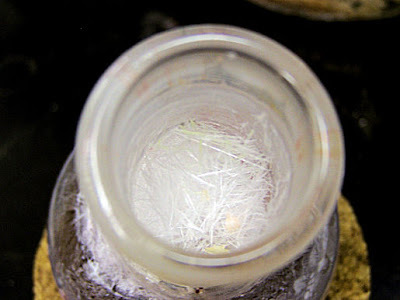 It always crystallizes into white needles at the top of the flask, and I'm not sure why. The reddish stuff is definitely the product. 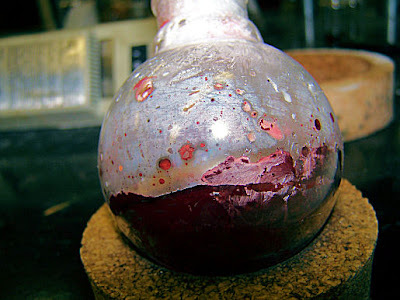 Probably I should mention that the imidazole is no longer molten in the photo, as the reaction has cooled down. 3. You cannot stop playing the game.